Recent experiments commissioned by the RATE project1 indicate that "1.5 billion years" worth of nuclear decay took place in one or more short episodes between 4,000 and 14,000 years ago. The results strongly support our accelerated decay hypothesis, that episodes with billion-fold speed-ups of nuclear decay occurred in the recent past, such as during the Genesis flood, the Fall of Adam, or early Creation week. Such accelerations would shrink the alleged 4.5 billion year radioisotope age of the earth down to the 6,000 years that a straightforward reading of the Bible gives. The research story starts in the late 1970s at Fenton Hill in the Jemez Mountains of New Mexico, about twenty miles west of Los Alamos, just west of a large volcanic caldera. 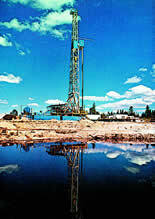 Geoscientists from Los Alamos National Laboratory were drilling (figure 1) several miles deep into the hot, dry granitic rock beneath the site to determine how suitable it would be as a geothermal energy source. They sent drill core samples to Oak Ridge National Laboratory for analysis. At Oak Ridge, Robert Gentry, a creationist physicist, and his colleagues ground up the rock, extracting hard, dense, microscopic crystals called zircons (figure 2, page iii). The zircons, were, as usual, radioactive. Much of the uranium and thorium in the earth's continental crust is in zircons, often imbedded in flakes of biotite, a black mica. The zircon-containing mica is scattered widely throughout the granitic rocks of the crust. The radioactivity makes helium. As a uranium atom decays in many steps down to a lead atom, it emits eight alpha particles, each of which is a helium nucleus composed of two protons and two neutrons. For the crystal size we are concerned with, most of the emitted alpha particles stop within the zircon originating them. Then each alpha particle quickly gathers two electrons from the crystal and becomes a complete helium atom. Helium is a lightweight, fast-moving, and "slippery" atom, not sticking chemically to other atoms. It can diffuse through solids relatively fast, meaning that helium atoms wiggle through the spaces between atoms in a crystal lattice. For the same reason it can leak rapidly through tiny holes and cracks, making it ideal for leak detection in laboratory vacuum systems. The rates are so great that those who believe in billions of years had expected most of the helium produced during the alleged long ages to have worked its way out of the crust and into the earth's atmosphere. In 1957 Melvin Cook, a creationist chemist, pointed out this problem in the prestigious scientific journal, Nature, asking in his title, "Where is the earth's radiogenic helium? "4 Radiogenic means, "generated by nuclear decay." In nearly half a century, uniformitarian scientists apparently have not found a good enough answer to publish in Nature. But creationists have a simple answer: most of the helium has not entered the earth's atmosphere. It is still in the earth's crust and mantle. In fact, the Oak Ridge team found that much of it is still in the zircons! It has not even had enough time to leak out of the crystals where it originated. Their results were remarkable. Up to 58 percent of the radiogenic helium had not diffused out of the zircons. The percentages decreased with increasing depth and temperature in the borehole. That confirms diffusion had been happening, because the rate of diffusion in any material increases strongly with temperature. Also, the smaller the crystal, the less helium should be retained. 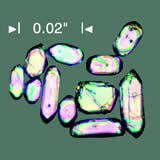 These zircons were both tiny and hot, yet they had retained huge amounts of helium! Many creationists, knowing how fast helium diffuses in many materials, believed it would be impossible for that much helium to remain in the zircons after 1.5 billion years. But we had no specific data to support our belief. As of 2000 the only reported helium diffusion data for zircons7 were ambiguous, and none existed at all for biotite. So the RATE project commissioned experiments to measure helium diffusion in zircon and biotite samples specifically from the Fenton Hill borehole. We also needed theoretical models to interpret the data. Thinking biotite was the main restriction, we published8 two models showing the biotite diffusion rates required to make the zircons retain the observed amounts of helium at the observed borehole temperatures for a specified time. The "Evolution" model assumed the time was 1.5 billion years, with continuous production of helium during the whole period. The "Creation" model assumed the time was 6,000 years, with most of the helium produced in one or more bursts of accelerated nuclear decay near the beginning of that time. Our experiments showed that we need to account for both diffusion from zircon and biotite, but zircon is more important. The resulting new "Creation" model differs by less than 0.05% from the previous one. The "Evolution" model did not change. So the numbers in our first models are still valid, but they now apply to zircon instead of biotite. Our zircon data agree with recently published data from another site,9 and both agree with our "Creation" model. The data allow us to calculate how long diffusion has been taking place—between 4,000 and 14,000 years! The diffusion rates are nearly 100,000 times higher than the maximum rates the "Evolution" model could allow. That leaves no hope for the 1.5 billion years. For most of that alleged time, the zircons would have to have been as cold as liquid nitrogen (196ºC below zero) to retain the observed amount of helium. Such a "cryogenic Earth" model would not help uniformitarians, because it would violate uniformitarianism! Three of my colleagues and I10 on the RATE project are preparing a paper with full technical details which we hope to present at the International Conference on Creationism in Pittsburgh next summer. In the meantime, friends and supporters of the RATE project have good reason to rejoice with us over these preliminary results, which strongly uphold the 6,000-year timescale of Scripture. RATE stands for "Radioisotopes and the Age of The Earth," a research initiative launched in 1997 jointly by the Institute for Creation Research, the Creation Research Society, and Answers in Genesis. See book in Reference 8, and numerous pages about the RATE project at (www.icr.org). Uniformitarians assume that "all things continue as they were from the beginning of the creation" (II Peter 3:4), without interventions by God which might drastically affect the rates of some physical processes. Larry Vardiman, The Age of the Earth's Atmosphere: A Study of the Helium Flux through the Atmosphere (San Diego, CA: Institute for Creation Research, 1990), p. 28. Melvin A. Cook, "Where is the earth's radiogenic helium?" Nature, 179:213, 1957. R. E. Zartman, "Uranium, thorium, and lead isotopic composition of biotite granodiorite (Sample 9527-2b) from LASL Drill Hole GT-2," Los Alamos Scientific Laboratory Report LA-7923-MS, 1979. R. V. Gentry, G. J. Glish, and E. H. McBay, "Differential helium retention in zircons: implications for nuclear waste management," Geophysical Research Letters 9(10):1129-1130, October 1982. Sh. A. Magomedov, "Migration of radiogenic products in zircon," Geokhimiya, 1970, No. 2, pp. 263-267 (in Russian). English abstract in Geochemistry International 7(1):203, 1970. English translation available from D. R. Humphreys. P. W. Reiners, K. A. Farley, and H. J. Hickes, "He diffusion and (U-Th)/He thermochronometry of zircon: Initial results from Fish Canyon Tuff and Gold Butte, Nevada," Tectonophysics 349(1-4):297-308, 2002. Drs. Steven A. Austin, John R. Baumgardner, and Andrew A. Snelling. Fifth International Conference on Creationism, Pittsburgh, PA., in process. * At time of publication, Dr. Humphreys was Associate Professor of Physics for ICR. Cite this article: Humphreys, D. R. 2002. Nuclear Decay: Evidence For A Young World. Acts & Facts. 31 (10).